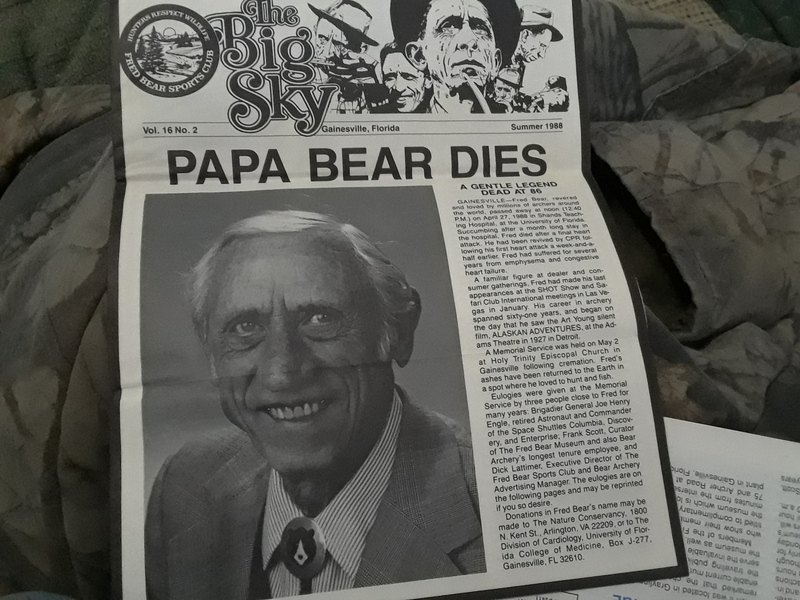 Today marks the 117th birthday of Papa Bear. Without Fred, bowhunting as we know it today might not even exist. May he Rest in Peace. Vooch, Lever Jac, olmarlin and 9 others like this. Happy birthday Fred. He was an incredible archer, I watched an 8mm video of him shooting ping pong balls standing up in a small outboard motor boat while the boat operator was pushing the motor back and forth. If I hadn't seen it I wouldn't have believed it. smoke-eater, olmarlin, Gr8rtst and 4 others like this. smoke-eater, olmarlin, Gr8rtst and 5 others like this. Still have both bows. But that 60's recurve, I can't draw it anymore. smoke-eater, Gr8rtst, 256WinMag and 3 others like this. Happy Birthday Fred ! 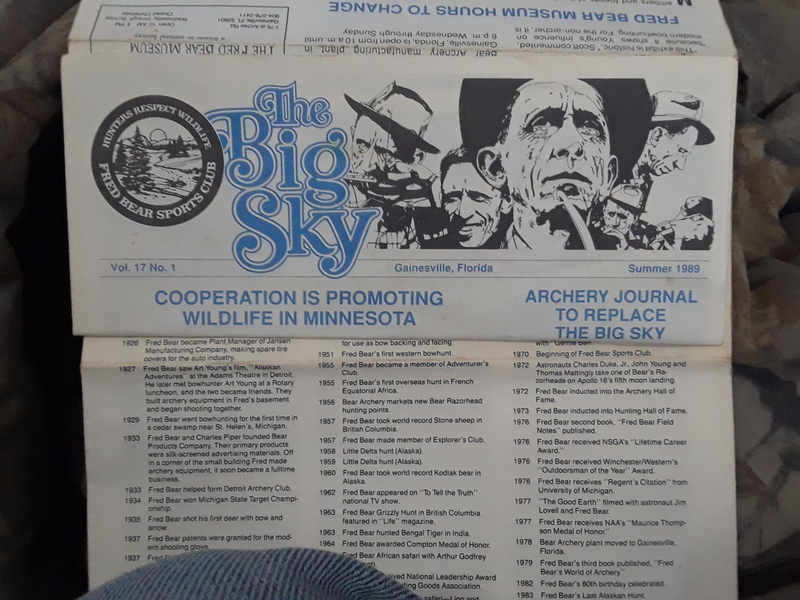 Started with a Bear Grizzly recurve and read all his exploits in the far north. He could be considered the father of modern bow hunting. smoke-eater, olmarlin, Gr8rtst and 2 others like this. I have some of his older videos. The one where he hid behind a rock and shot a big brown bear from about 30 feet was his most famous. He also got cape buffalo and elephant. 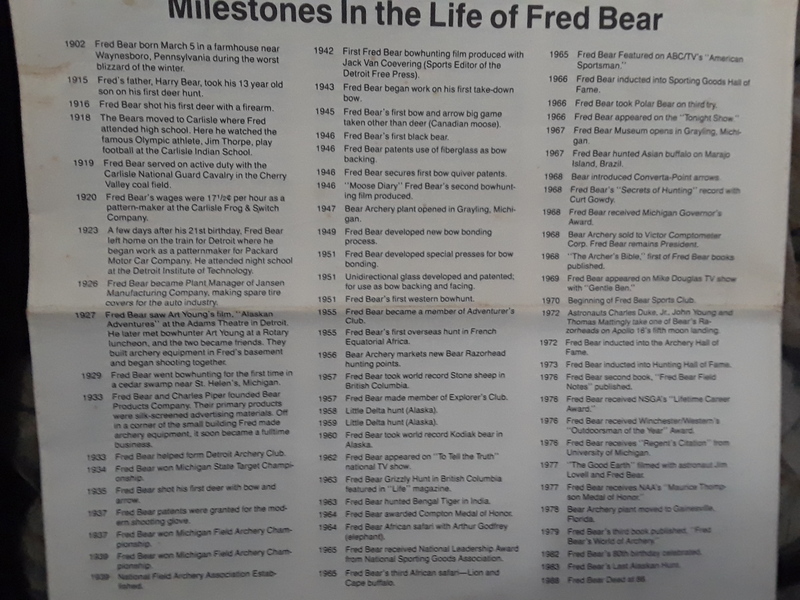 Also have the book "On the Trail of a Bear" that was about Fred. I liek his older broadheads and got a deer with an old razor head with a 48 pound revurve. There was a notch in the oppsite rib that looked like it stoped the arrow. The interior damage was impressive as the arrow worked its way back out. Inever used real powerful bows. Bear used about 60-65 pounds. olmarlin, Gr8rtst, smoke-eater and 3 others like this. God Bless the "Father of modern archery". I still have my Bear 52" Kodiak Magnum recurve with the 50 lb. draw weight. I bought it in 1968. The serial number was hand-written on the side of the bow. My bow is a left-hand model and came camouflaged from the factory. It is still in excellent condition and every once in awhile I string it up and flex the limbs. I know I can't hold it more than a few seconds anymore. The shorter limbs were famous for stacking up at full draw (or almost full draw), and was tough enough when I was young. His videos and his demonstrations were remarkable. smoke-eater, olmarlin, 256WinMag and 2 others like this. Howard Hill promoted archery to a large part as well. Let's not forget Howard. Damon Howatt at Martin Archery was another great archer from this early era of the sport. But Fred Bear figured out how to mass produce quality bows for an affordable price. He carried an entire product line for archers and introduced better broadheads than anyone before him. Years later Fred Bear and Tom Jennings worked together to design the Whitetail Hunter which was the first mass produced and successful compound bow. Although slow by today's velocities, this famous bow downed quite a lot of game. All my hunting buddies bought this model during the early 1980's for its let off at full draw. My first compound bow was the Whitetail II and I still have it. This bow seems to show almost no wear after all these years! Bear Archery builds a quality bow for an affordable price that typically beats the competition for features and quality. You can buy a Matthews bow for twice as much but you don't get twice the features if you know what I mean. no primers, Gr8rtst, 256WinMag and 3 others like this. 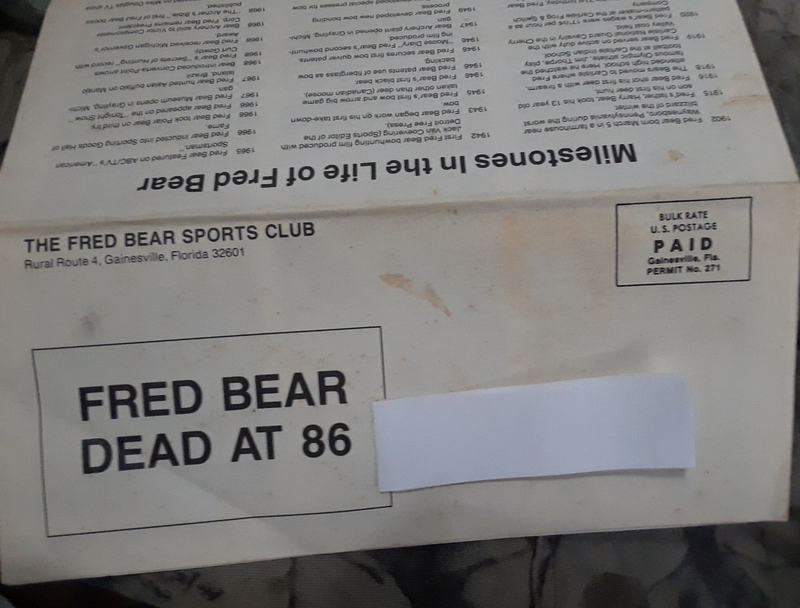 I was a member of the Fred Bear sports club . Never had any of his long bows , but started with his first compound the 6 wheeler whitetail. 256WinMag, marlinluvr, locoman and 1 others like this. By txbeaux in forum The 45/70 Govt. Fred Bear Grizzly possibly? Advice?